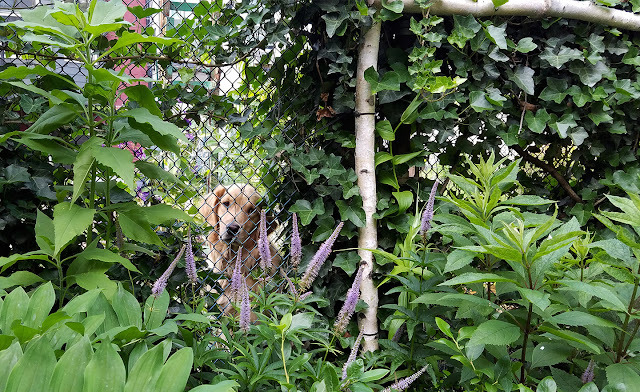 Meet Beeskwee (Biscuit), my occasional gardening companion, on the other side of the fence. The fence is actually falling down. The rusted post at one end, far left, is loose, and it is kept propped upright by a concrete birdbath on Biscuit's side and a big stone on ours. I had intended a better fix but it's harder than we thought, because of rocks, rocks, rocks. The post in the middle (behind the birch pole) is very sturdy. No one knows whom the fence belongs to. The chainlink is ugly so in this case I am grateful for the existing English ivy. I also planted tall North American natives Jerusalem artichoke (Helianthus tuberosus, far left) from store-bought tubers, Veronicastrum virginicum (in bloom, above), Joe-Pye weed (Eupatorium pupureum, right) and a South Africcan gloriosa lily (Gloriosa supberba) to do more screening. But Beeskwee still has this convenient gap where she sometimes sits and stares at me. She likes it when we braai meat, too. Sniffing appreciatively. Perhaps waiting for the rising of the Dog Star, Sirius. every dog needs a garden... or perhaps every garden needs a dog. What a sweet picture. I'm glad you have a gardening companion. Our golden loves to be in the garden with us. It helps to throw a few of the thousands upon thousands of stones (nay, boulders!) we dig up every year from our heavy clay soil. For us gardening is mining not agriculture! He has more fun with stones than we do, that's for sure. What a sweet face!! It must be tough to not share your grilled meat with that sweet girl! What a sweet face! It is always great to have a cat or dog garden companion.